ometimes the craftiest creative ideas are also the simplest. 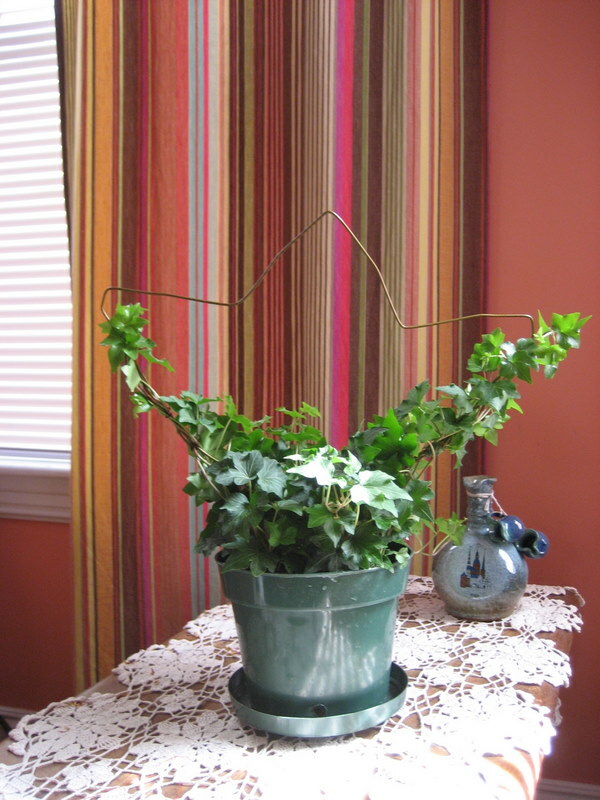 Enter the old-fashioned and super-easy ivy topiary project. I’ve been settling more and more into my job here and recently decided that my small office space needs to be spruced up. I cleaned up and consolidated various storage containers and uncovered a lot of empty space on and around my desk. What could be better to occupy it than plants? There is very little natural lighting in the office, but the fluorescent light should provide enough light for a non-fussy plant. Our local supermarket had small pots of ivy and I thought that it might be interesting to try growing an ivy topiary in the office. Now I only hope that my brown thumb magically turns into a brownish-green one and the plants survive. 1. 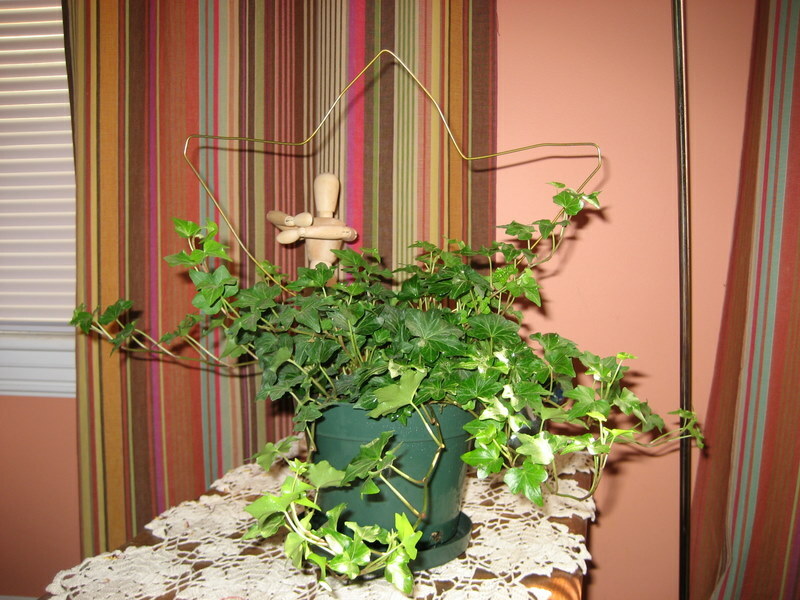 A potted ivy plant (or ivy you are going to repot, potting soil and a flower pot). 3. A pair of pliers or a pair of your own work-gloved hands. 4. Green heavy-duty thread or floral tape. 5. (Optional) 8 inches of steel or copper wire. 1. 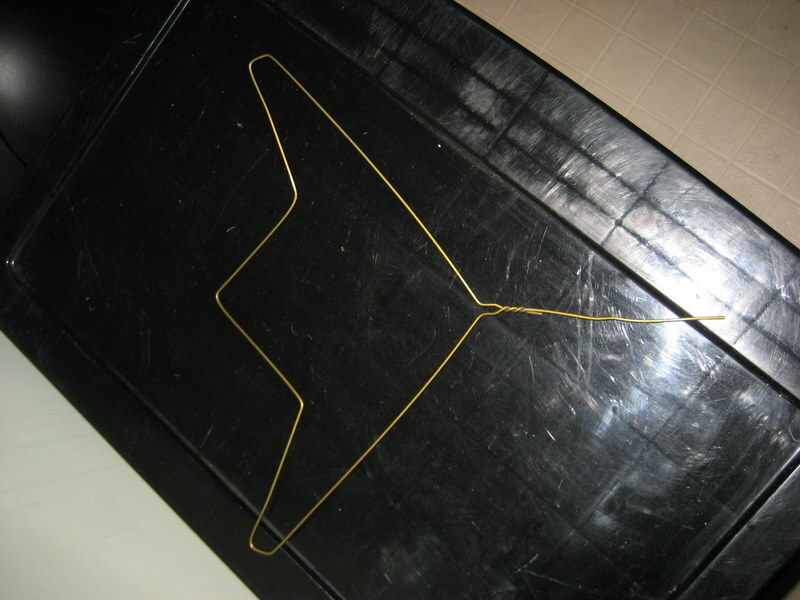 Using pliers or your hands, straighten the hook part of the hanger to form a straight piece. 2. 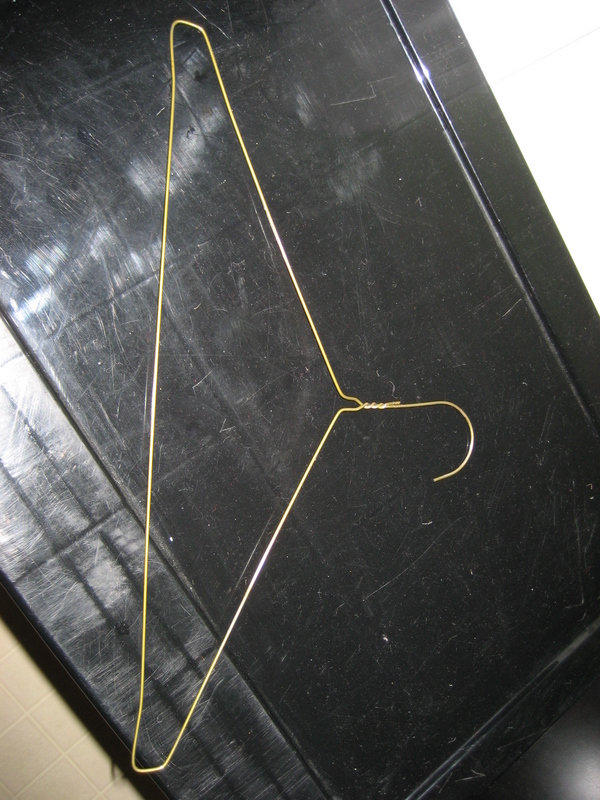 To achieve a “tulip” shape, bend/fold the horizontal bar of the hanger out, so that you get a diamond connected to the straight piece of wire that you created in Step 1. 4. Insert the straight piece down into the center of the pot. If the straight piece is longer than the height of your flower pot, you can cut it or bend it to the correct length. 5. (optional) Cut two 4-inch pieces of steel or copper wire and bend each in half to create a U- or V-shape. 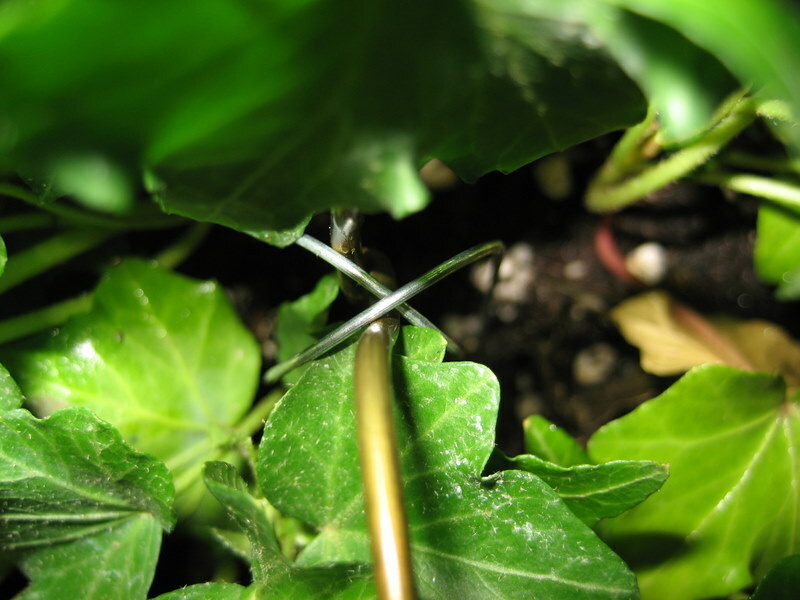 Insert one of the U-shaped wire pieces into the soil, crossing the wire hanger at a 45-degree angle. Now insert the second U-shaped wire perpendicular to the first. Contrary to what you might think, this step doesn’t require any knowledge of trigonometry – I am simply trying to support the hanger topiary structure and prevent it from falling over. A picture is worth a thousand words. 6. 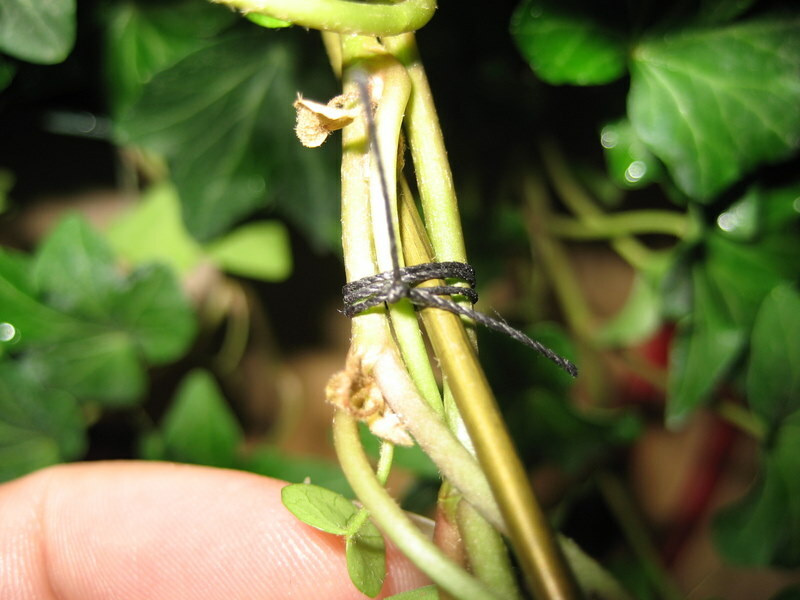 Take the longest branches of the ivy plant and decide which ones are going to go onto which side of the wire structure. 7. Loosely wind the branches around the corresponding side of the wire hanger, making sure to always wind in the same direction. Tie loosely with thread or floral tape in several places along the wire form (if using floral tape, carefully stretch it as you wind it around the branches to make it stick to itself). So here you have it – the beginning of an old-fashioned ivy topiary with a modern twist. 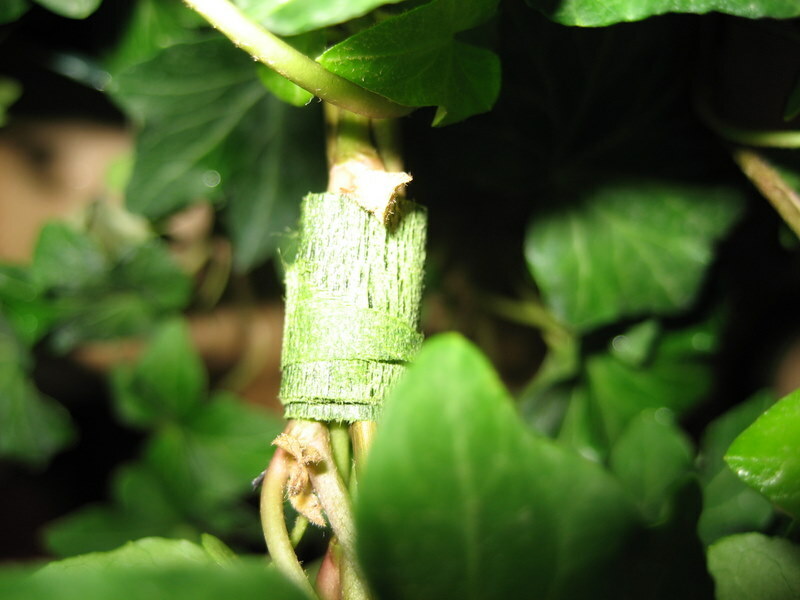 As your ivy grows, keep winding the branches around the wire structure and attaching them to it. When the branches are long enough that the two sides meet at the top, continue to wrap them in the same direction, i.e. overlapping the two sides and letting each side grow down towards the pot. Be sure to prune your topiary regularly – you want the wire to be completely covered by the plant yet still have the “tulip” shape. When pruning, use sharp scissors and cut just where the branch meets the stem. P.S. My absence from blogging is inexcusable. And while I even have some real excuses for not posting, I’ll spare you the details… Please forgive me, my dear readers – I hope you keep reading and keep crafting.